Now repeat the same movements as described above except this time your torso will remain straight as you go up and the bar will touch the back of the neck instead of the upper chest. Tip: Use the head to lean forward slightly as it will help you properly execute this portion of the exercise. Once you have lowered yourself back down to the starting position, repeat the exercise for the prescribed amount of repetitions in your program. Caution: The behind the neck variation can be hard on the rotator cuff due to the hyperextension created by bringing the bar behind the neck so this exercise is not recommended for people with shoulder problems. 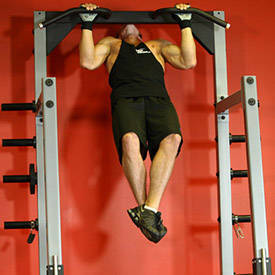 You can also use a pull-down machine.